England coach Mike Catt has played down comparisons between Jonathan Joseph and legendary centre Jeremy Guscott but says Manu Tuilagi will have to impress if he is to force the Bath No.13 out of the side. Joseph scored twice for England against Italy despite being moved to the wing in the early throws of the match. Despite being shifted from his familiar outside centre spot to the flank, Joseph scooped the Man of the Match award and increased his try tally to three in two Tests. 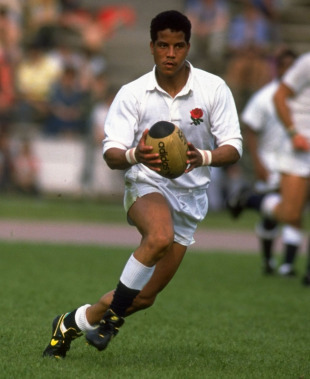 Following his darts through the Italy defence and his style of running, comparisons were drawn between Joseph and perhaps England's finest centre Guscott. Catt drew those comparisons four years ago but has played down any like-for-like similarity. "He's a different player," Catt said of Joseph in comparison to Guscott. "Jerry was more of a swerving outside-centre, you know, when there's a big hole in the 13 channel. There aren't many holes any more. "So JJ's footwork and his ability to slip out of tackles and stuff, like you saw today and last week, is phenomenal. That's the X-factor you need to win games. You know you need X-factor like that to be able to break defences down." Catt says Guscott's tally of 65 caps for England sees him still on another level to Joseph but he was full of praise for the 23-year-old in the wake of their win over Italy. Such was the ease at which Joseph slotted on to the wing, England may consider him there as a permanent fixture in the future but he is likely to be staying in the centres for the time being. "To be honest we haven't really thought about it, but listen, he's a talented kid, a smart kid," Catt said of Joseph. "Like Stu [Lancaster] said, he's becoming a leader. He's very vocal at training now. So, he's very comfortable wherever he plays I think. "He's one of those guys who just wants to play, as long as we play in a particular way. He's brilliant in the air too; exceptional, like Ant and Jonny are. At international level that's been one of the key parts of our game as well." Joseph's chance in the outside centre shirt was aided by Tuilagi's unavailability with the Leicester centre continuing his lengthy comeback from a groin injury. Tuilagi is a favourite of Lancaster and there is a chance the pair could link up in the centres come the World Cup and the likelihood is England will take both, if fit, rather than it being a shootout between the pair for a spot in the 31-man squad. "Going into a World Cup you've got to have four centres," Catt said. "Having guys like Manu who can break down a defence in a different way to how JJ does is what you want. You've got a good balance there and competition. "For Manu to get his place back you're going to have to see some fireworks there. Let's see how it carries on going. It's just great to have a consistency again between a centre partnership. We'll see how they develop. I'm sure they will."